The loggerhead shrike (Lanius ludovicianus) is not related to a familiar sea turtle that is currently beginning to nest on local beachfronts, but rather is a thickbodied songbird that is so-named due to the relatively large size of its head as compared to the rest of its body. These tweeters sing during courting or do so to maintain territories. While smaller than a robin, the loggerhead shrike can attack larger prey and is nicknamed the “butcherbird” after its carnivorous tendencies. The gray bird with a black mask and black wings with white markings is known for impaling rodents, lizards and other birds on thorns or barbed wire so that they can return and eat their caught prey later. The shrike patiently waits on elevated perches and hunts by scanning the ground area, then dives at its prey and uses its thick bill with a small hook for killing. The northern mockingbird and Clark’s nutcracker are similar bird to the loggerhead shrike. It is smaller than the northern shrike but has a similar call. 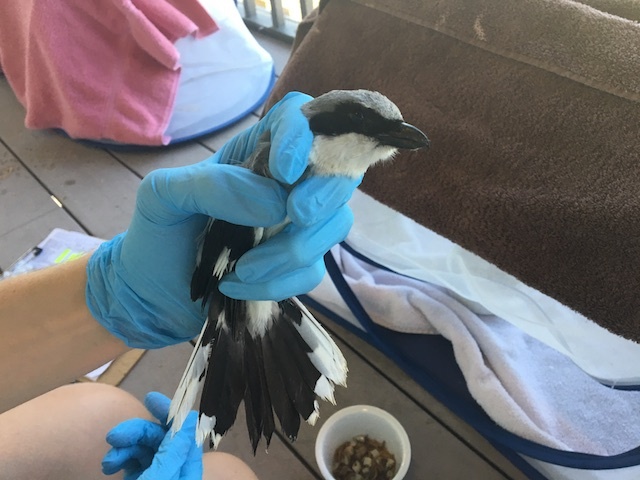 At CROW, an adult loggerhead shrike was admitted to the hospital from northeast Cape Coral. The bird was found on the sidewalk, and the finder noted that it had ants on its face. When the bird arrived, it was noted in the intake exam to having swelling of its right shoulder and was suspected to have a fracture of the right coracoid, similar to a collarbone in humans. X-rays confirmed the right coracoid fracture. Shortly after its April 6 intake, the patient’s right wing was placed in a body wrap and the bird was given pain medications. On April 15, CROW medical staff inspected the fracture by palpation and deemed it stable. Three days later, the body wrap was believed to be no longer necessary. “There does not appear to be any complications due to the fracture at this time, and it has normal range of motion in the wing,” said Dr. Bast. 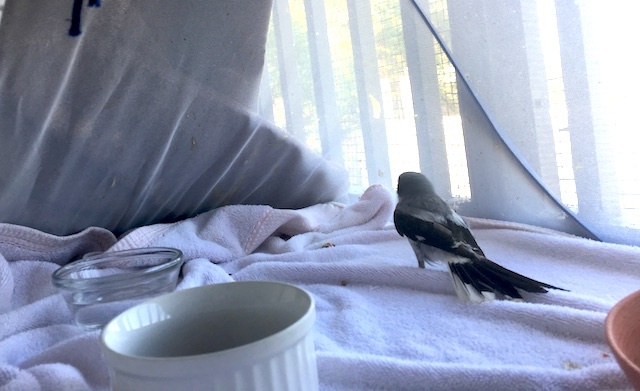 “It is building back strength in the muscles on the affected wing.” By April 24, the loggerhead shrike was closer to being moved to an outdoor enclosure for more extensive rehabilitation. “The patient will likely be released within the next one to two weeks once it has regained normal flight patterns,” added Dr. Bast.